WONDERING WHAT ALL OF THE EXCITEMENT IS ABOUT? To view the 2019 program click on the thumbnail below! What is the CMA/SIMA Conference? If you’ve never been to the CMA/SIMA Conference before, let us be the first to welcome you. Retailers, manufacturers and technology professionals join together annually in a non-competitive, knowledge-building and sharing environment focused on best practices and industry standards, future trends, training & professional development, cross collaboration and making meaningful connections to solve industry challenges and jump start your new year. Did you know the conference is turning 11 years old this year? What have you been waiting for? Who attends the CMA/SIMA conference? The conference is not only for CatMan and Shopper Insights professionals. The event incorporates all aspects of today’s CPG and retail landscape. From E-commerce, shopper marketing and space planning, to supply chain, pricing & promotions, talent acquisition and so much more! The sessions, keynotes, trainings and networking are rich experiences for the seasoned pros and new young talent. It pays to have the most up-to-date information and peer perspectives on the current state of the union. What is the conference like? The conference is a combination of keynote speakers, breakout sessions, training, solution provider demos and networking events. We bring in industry-leading category management and shopper insights professions who are solving the same problems you face everyday. Through case studies, demonstrations, exploration and networking, attendees are armed with tools that will help move the needle for their organizations. Who are CMA and SIMA? CMA is the Category Management Association. SIMA is the Shopper Insights Management Association. We are professional associations that provide thought leadership, membership, best practices and certification to retailers, manufacturers, universities, and solutions providers from all over the world. Who will I meet and hear from? When and where does the conference take place? The 2020 CMA/SIMA Conference will be taking place February 23-26 in Dallas, TX. Build your knowledge. Build your network. Missed this year? Take a peek HERE at what you missed! What is the CMA Conference Known for? 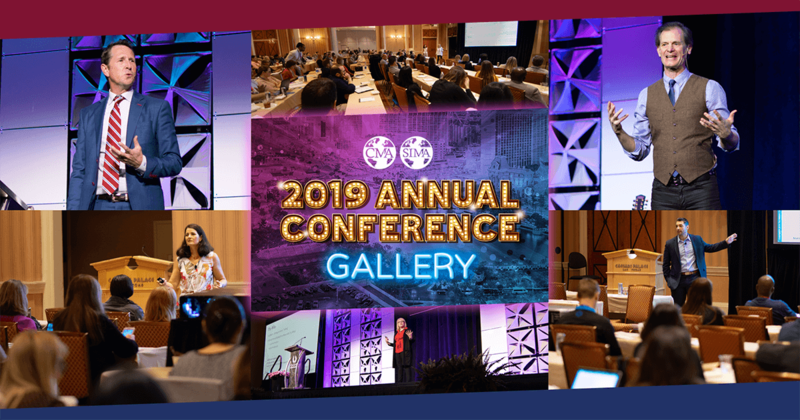 Click here to visit the 2019 Category Management & Shopper Insights Conference Photo Gallery! Our Keynote sessions offer inspiring topics on business critical issues facing today’s industry. Multiple channels are represented speaking to industry challenges & opportunities, Shopper Insights, Shopper Marketing & Ecommerce issues. Apply to Speak Today! Want to hear how ‘real-world’ people from real companies address and solve ‘real-world’ issues? We strive for a balance of different categories, different size companies, different retailer focus, and different available resources. Apply to Speak at the 2019 conference today! Training & Education is a vital piece for you to be able to apply your catman and shopper insights knowledge. Jump start the conference with expert lead & structured training groups that provide high-impact educational sessions. Our training accommodates to all levels! Networking is a huge part of your professional success. Meet with peers to collaborate, hear new ideas, & validate or change your perspectives. The CMA’s scheduled networking has been lauded as a most valued part of the conference by attendees. The CMA strives to offer the most valuable content in an interactive and collaborative environment with the intent of every attendee coming away inspired and possessing new ideas to impact their business. View the 2019 Agenda Page! Our Solution Provider Demos offer a unique ‘rotating’ experience allowing you snapshot of the capabilities of the Sponsors. Especially helpful when wanting to identify who you want to learn more about and how they can help you! Become a Sponsor Today! Solution Providers will showcase a case study, market research, collaborative project or industry study giving the attendees examples of the application of their expertise and capabilities. See last year’s IP speakers & Become a Sponsor Today! The SIMA, recently launched by the CMA, exists to help its members drive meaningful basket and brand growth and improved shopper experience at all touch-points. The CMA will continue to incorporate shopper insights into its growing curriculum. *IMPORTANT: In order to register for the conference, each attendee must have a “user account”. If you already have an account, you will be directed to login. If you do not have an account, create a new user account here. If you are unsure if you have an account, please contact memberservices@cpgcatnet.org or call 512.557.4339.